You are here: Home / Mac / So … How About that Mac Pro, huh? So … How About that Mac Pro, huh? I was going to bed last night, trying to figure out the ideal setup for my home office. It’s not that I’m dissatisfied with my 15-inch MacBook Pro, but it’s that I’m spending a lot of money on external drives and storage, as well as using up desktop real estate at an alarming rate. I thought to myself, “If I’m spending $1000-$1500 on network attached storage, why not spend a touch more and have it built into a powerful computer?” Instead of going to bed, I went over to my desk and checked out the Mac Pro. Let’s face it, this thing is beautiful. The engineering behind it is amazing, the expandability is awesome, and the Â power is just … well, it’s a bit outdated at this point. It runs an Intel Xeon processor, which was pretty cool over a year ago when it was introduced in the Mac Pro, but today, it’s a bit behind the curve. I’m wondering why there isn’t an I7 in the thing at the minimum. So why has it been over 400 days since it was last updated? That’s a good question, and one that I really don’t have a good reason for, so I can only guess. Coincidentally, that’s what I’m paid to do, so here goes. 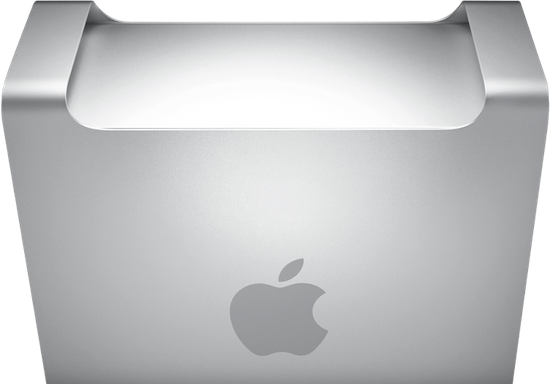 The Mac Mini was in the same case for five years or so, and it did pretty well. The Mac Pro has been in the same case for years, so it’s possible that Apple is planning a redesign of the popular case. It’s also possible that they really want to ramp up the power for this next model, and they’ve got something big planned. Or, maybe they just really don’t care about the Mac Pro since the iPhone is selling like hotcakes. Actually, the Intel Xeon that the Mac Pro has it’s probably better that a Core i7. Both the i7 and the Xeon are based on the Nehalem microarchitecture so they share many things. And the Xeon is made for servers and workstations while the i7 is made for home computers and servers/workstations require more power than a home computer. So, it makes no sense to include an i7 in a Mac Pro. I hope you’re right. I’ve been waiting to see an upgrade so that I can stop using my MB Pro 17 as a desktop unit. I like the idea of having a Mac Pro with an iPad as a perfect combo. They probably sell less of these than anything else, including AppleTV. Apple’s interest in computers seems to be waning. They are likely devoting little engineering resources to this market. You are correct about Mac Pros needing an update. They don’t have USB 3.0 or SATA 3.0 (6GB/s). They have a limited number of overpriced video card options. The Mac Pro is beautiful in the same way a 1930’s Packard automobile is beautiful. Both are gorgeous sculpture but far from modern. They may not sell many, but I imagine the Mac Pro is more profitable on a per unit basis than anything else Apple sells. And with a reasonably entrenched market of professional users, I doubt it is indifference that has delayed a refresh. Ostensibly, Apple is waiting on adequate supplies of hex-core processors from intel, which reportedly were constrained until the end of the 2nd quarter… which ended yesterday. Hopefully we will see something soon — I’ve been putting off purchasing a new one for weeks. I feel the same way, I have a Mc Pro at home I use for everything like big graphics jobs etc. At work I had a dual G5 machine, with lots of RAM. Over time I gace the G% to my daughter as I found that my Macbook Pro was faster at all that was Intel. Now faster is all relative as you know. The honking Mac Pro at home is much faster and it is old. Memory is the big deal in working on most projects even non graphics based ones just lots of larger data sets with lots of memory hungry programs. I want to buy a new work machine but buying an expensive 2 year old computer is just not right and while I would consider an iMac it has a bit to little – memory capability, processor speed, ports etc. I want to see the Mac Pro and hope it is really powerful and not to expensive! Let’s not forget the impact that the quad core i5 and i7 iMacs have had. For some pro users, the iMac is now more than plenty. Apple has really limited the need for the Mac Pro with the iMac line. Obviously there are still people who need the Mac Pro, but it’s getting less and less with each update to the iMac line. The current Mac Pro has one or two Nehalem Xeon processors, which have the i7 architecture (directly attached memory, no intermediate memory controller chip). The question “Iâ€™m wondering why there isnâ€™t an I7 in the thing at the minimum” is malformed. Give Apple a little time and they will delight. Try to balance speed, memory, storage, and expandability. A Mac Pro is usually a five year commitment for most folks. Well I’ve been waiting patiently for a really long time… I’m really hoping one comes out soon. Or comes out at all. I have a four year old MacBook Pro that is constantly plugged into a 30″ monitor, USB hub, a couple external hard drives. I need a desktop and won’t buy a computer that hasn’t been updated in a year and a half. I work with multi-gig photoshop files and could really use something with some muscle. C’mon Apple… I’m waiting with my credit card.